Jerome Napoleon Bonaparte II (November 5, 1830 – September 3, 1893) was a French-American military officer who served in the United States Army and later in the French Army. He was the son of Jérôme Napoléon Bonaparte and Susan May Williams. He was born in Baltimore, Maryland, as the son of Jérôme Napoléon Bonaparte and his wife, Susan May Williams. He was the grandson of Jérôme Bonaparte (who reigned as King of Westphalia from 1807 to 1813) and the grandnephew of Emperor Napoleon, who died in 1821. 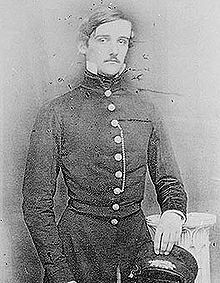 Bonaparte entered the United States Military Academy at West Point in 1848 and graduated 11th in the Class of 1852. Upon graduation, he was commissioned as a second lieutenant and served in Texas with the Regiment of Mounted Riflemen. Bonaparte resigned from the U.S. Army in August 1854 to serve in the army of his first cousin-once-removed, Emperor Napoleon III. A few weeks later, he was commissioned as a lieutenant of dragoons in the French Army. He fought in the Crimean War, Algeria, the Italian campaign, and the Franco-Prussian War, rising to the rank of lieutenant colonel. Louise-Eugénie Bonaparte (1873–1923); married, in 1896, Count Adam Carl von Moltke-Huitfeld (1864–1944); they have numerous descendants. Jerome Napoleon Charles Bonaparte (1878–1945); married, in 1914, Blanche Pierce Strebeigh, daughter of Edward and Emily Pierce of Newtonville, Massachusetts, and former wife of Harold Strebeigh of Hewlett, New York; no issue. Had his family not been excluded, he would have been first in line to the Bonaparte succession from 1873, and would have succeeded in 1879. He died on September 3, 1893, in Prides Crossing, Massachusetts. His letters from Fort Inge and Fort Ewell have been preserved by the Maryland Historical Society. ^ a b c "Jerome Napoleon Bonaparte, Jr.". Handbook of Texas. Retrieved 2017-10-29. ^ "Caroline Le Roy Appleton Bonaparte (1840-1911)". Find A Grave Memorial. Retrieved 2018-02-20. Wikimedia Commons has media related to Jérôme Napoleon Bonaparte II. This page was last edited on 17 March 2019, at 01:31 (UTC).